Sniffer, I pasted the link to this syringomyelitis rhread for you before tj's post! Pat me on the head? Regarding the constant urge to poo, try this: vinyl glove. Olive oil lubricant. You wouldn't have to insert your finger far before the tip of your finger will encounter a firm "pellet", if anything is really there. If so, coax it out with your finger. It's nice that you haven't had to contend with this until now, but this is the daily drill for many of us. Vintage please accept my apologies, you did indeed post the syringomyelia thread and I thank you. I've got an MRI image of the cyst in my spine. It's located around C6 and although it's fairly bulbous and has travelled slightly upwards, it's been stable for fifteen or so years. Not worth operating on. No loss of sensation or movement. The cyst has been there for many years, probably twenty or more. 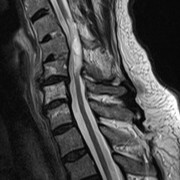 It is rather worrying to see it on an MRI image, along with the surrounding mangled vertebrae. It's no wonder my neck aches so much. I have to say, the whole thing looks sickeningly hideous. Anybody looking at this scan would be horrified. I wish there was some way that I could upload it. *So, you want the rest of us to suffer your horror. Hmm. We need a thread called show and tell, which I might just avoid. Post it Mikeq. Gross us out. I don't have a cyst but they thought that it was until they did the Myelogram. Come to find out what looked like a giant cyst was an empty and swollen thecal sack about 15 inches in length and shaped like a oblong balloon, the kind they twist into animal shapes. The neves been had all been encased in scar tissue around the outside of the thecal sack and it was all extremely swollen. The nerves were no longer receiving the vital nutrients CFS, and the scar tissue had grown into and around the Cauda equina nerve roots. Not at all what we had hoped for nor could we even had imagined those results. image is on my computer. how do I upload when there's no 'browse' facility? I had a 5th MRI on Saturday 24/06. Just over three years since previous one. My cyst (Syrinx) extends from T 3-11. At the sight of my injury, T 5-8 there is very little cord substance. It'll be interesting to see if there is any further deterioration. Mikeq, try this. Does your screen on this forum give you the choice between Quick Repjy and Full Reply? It would be written on the turquoise bar above where you write the message. Choose Full Reply. Then you'll get more choices. Pick Attach Image. Okay, vintage, thank you for that. I’ve had to convert the image into a JPEG file, so I hope it doesn’t lose its transparency or diminishes its quality in any way. So here is my crushed spinal cord, the hideously distorted spinal vertebrae, and of course the cyst which you can clearly see level C5/C6. It’s a miracle that I am neurologically a C6 tetraplegic. You had described it right. With all that medicine can do there is so much more that they can't and if you are one of the unlucky ones it's sorry ,see you later. Now you are another medicine mans' problem . Knowing full well they aren't able to help some of us either. I wish that I had a copy of mine that I could share, but I don't. I wanted to know if anyone can help me to ascertain in particular from the bottom finding impression from an MRI I had what craniocaudal is and just how big this syrinx is? Thank yo in advance kind of worried since I received my MRI findings. Have not yet talked to Neurologist since findings. Small syrinx with craniocaudal dimension of 1.1 cm adjacent to the level c6-7 I can see no associated findings. Mild to moderate narrowing of the left neural foramen at the level of c5 -6, secondary to degenerative changes. I fed “Small syrinx with craniocaudal dimension of 1.1 cm” into Google and learned a little. First., 1.1 centimeters = 0.433 inch. So, your syrinx, Steven, measures a little less than a half inch, as seen from a craniocaudal direction. “Craniocaudal” is a word that describes the direction of the x-ray beam. And here is a forum where others with a syrinx share their experiences with medical professionals. “Many of us struggle with physicians who seem to believe that symptoms correlate strongly with syrinx size, even though there is no supporting research. I say the patient's own senses are a powerful diagnostic tool; listen to your patient. Thank you very much for your reply and insight it is much appreciated. I'm glad I found this forum.